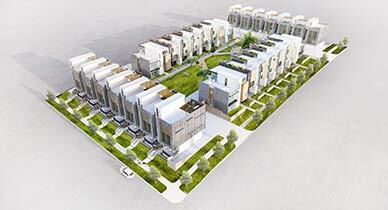 Description: Artifex10 was commissioned to design a modern, central urban garden and courtyard green space serving as a primary community amenity space for the surrounding LEED certified Townhomes. Framework at Sloan’s Lake stands to offer homebuyers an opportunity unlike anything else in the City of Denver. Situated just west of Downtown, the future home sites of 8 Single Family and 14 Multi-Family units provides unparalleled views of Downtown Denver to the East, Pike’s Peak to the South, and a newly redesigned Sloan’s Lake and the Front Range to the West. The proximity to Downtown for work and Sloan’s Lake and the Mountains for relaxation and recreation are uniquely Denver, however it is perhaps the vision and approach of the development that sets it apart. Instead of looking to maximize profit based on location alone, the development and design teams intend to offer a ‘community within a community’ that promotes the notion of neighborhood while strengthening the Sloan’s Lake community as a whole.